An Accounting Clerk is accountable for providing accounting support and assistance to the accounting supervisors. The day-to-day tasks mentioned on the Accounting Clerk Resume include some or all of these – providing clerical and accounting support, typing and maintaining accounting documents, preparing bank deposits, reconciling accounts, entering financial transactions in database, providing assistance and support to accounting department, researching and restoring accounting discrepancies, processing bills for payment, filing and tallying deposits and ensuring efficient operations in accounting department. The requirement for this post includes – comprehensive knowledge of accounting procedure and principles, familiarity with bookkeeping and basic accounting procedures, knowledge of accounting software, and hands-on experience with spreadsheets. While a high school diploma or its equivalent is the minimum requirement, more education and relevant work experience will be generally preferred. Summary : Highly focused and meticulous superior Bookkeeper (QuickBooks Pro) with an exceptional orientation to detail and good customer service. Adept multitasker with strong abilities to address a high volume of simultaneous customer concerns with accuracy and professionalism. Able to function well independently or as part of a professional accounting team. High Abilities to use all MS Office Applications. Responsibilities include processing payables invoices, consulting with buyers on price discrepancies and quantities, giving vendors up-to-date information on invoices including pay dates, check #'s, etc, and assist with month end reporting. Match invoices keyed the previous day to print out sheets and file them according to vendor number. Completed monthly bank statement reconciliations for the orangeburg sc, mcrae ga, and salem wi facilities; as well as, two bank accounts one at bank of america and the other mcrae merchants and citizens bank. Maintained a daily cash sheet that details the wire transfers that hit our bank account for the month and prepare the journal entries by day for entry. Responsible for keying all month-end journal entries into the general ledger for month end closing. Compiled and completed monthly accrual journal entries for month end closing that i am responsible for. Processed some inter-company clearing invoices and prepare the journal entries that coincide with these invoices. Completed weekly vendor payment check cycles, and help with year end inventory. Performed the sorting and distribution of employee payroll checks on a weekly basis for several years. Headline : Seeking to secure an Office position that is offering extensive experience working in fast-paced environments demanding strong organizational, technical and interpersonal skills. Processed all invoices for products and services per the company(s) policies and procedures, validate all invoices against purchase orders and receiving documents. Document filing, word processing, database input, and management report generation. Review/obtain approvals from management prior to payments being made to vendors. Prepare and record all monthly recurring expenses (i. E. , rent, utilities, leases, loans, etc. ) process employee expense reports when they were not paid through payroll review analyze and reconcile aged payable reports. Prepare a weekly meeting and take minutes to document communication in order to meet company objectives and to collaborate and set priorities and make sure we are hitting appropriate deadlines. Prepare weekly payment selection and review with controller prior to processing payments. Process credit applications and obtain credit reports for customers requesting credit. Generate aged receivable reports for customers past due, give copy of reports to controller process credit card transaction as needed, record credit card transactions in our system, i forward credit card receipts to customers as well as maintain files for our tax exempt certificates and 1099's for the end of the year. Enter data for reports, production items, shipping, invoicing, respond to email inquiries and managing inventory. 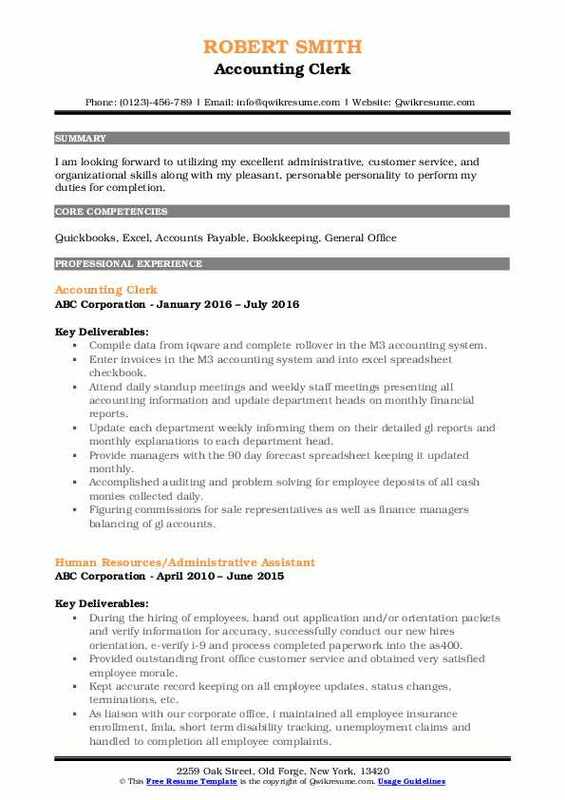 Summary : To work within a company in a position that will allow me to utilize my diverse skills set in order to grow professionally as a well as provide the highest quality service to my employer and the customer. Responsibilities responsible for processing weekly payroll, anniversary pay, & annual holiday bonuses for 900+ employees for six ga based companies & one tn based company in the marketing industry. Created & maintain detailed spreadsheets for benefits to be recouped via payroll upon employees' return to work from leave, layoff, or vacation. Thorough communication with human resources & controller to achieve accurate payroll processing on a weekly basis. Responsible for processing weekly payables for one large multi-million corporation (formerly four corporations which merged). Review details, accurately code, & key all invoices, child supports, & intercompany payables into mas500. Assist controller with any general ledger discrepancies when necessary at month end or quarter end. Download american express statement on a monthly basis & responsible for submitting online payment for a material dollar amount. Created organized, informative, & useful american express spreadsheets which were presented to C.F.O & Vice President for approval to be emailed to approximately 50 cardholders on a monthly basis. Review all credit card receipts to ensure correlation with statement, general ledger codes, & intercompany payables. 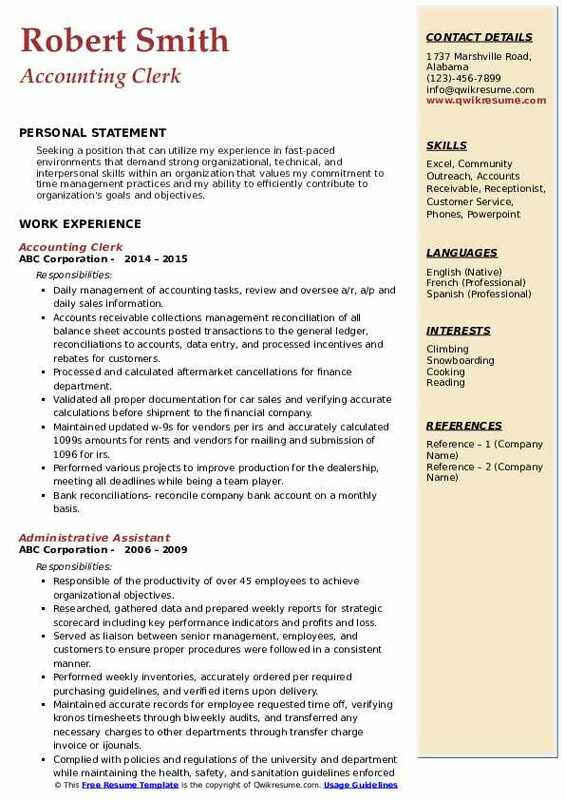 Summary : To obtain a position in which to apply years of experience in accounting and administration, as well as strong interpersonal and problem-solving skills, in a goal-driven business. Established client payment plan program to monitor payment compliance and progress, reducing uncontrolled payment activity by 10%. Balance out cash drawer and assist with balancing daily deposits process credit card payments and charge backs. Compiled data for 1099-k monthly for yearly taxes calculated figures such as discounts, percentage allocations and credits. 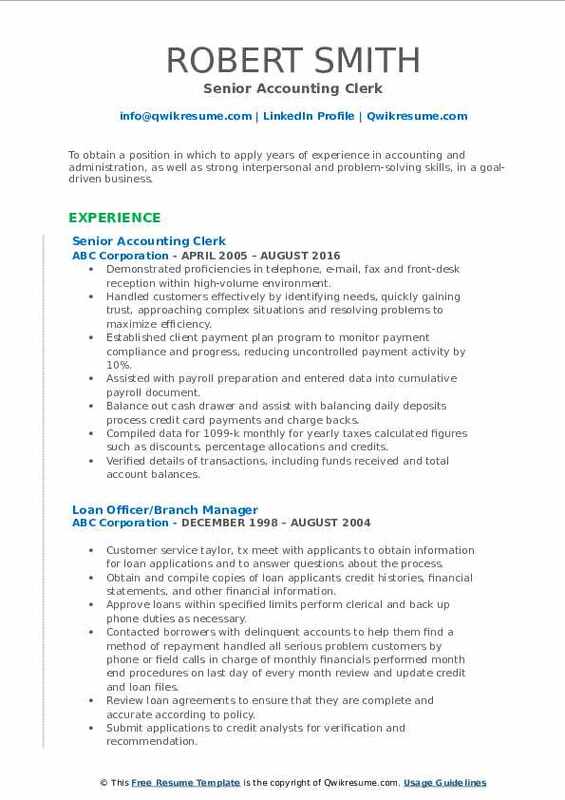 Summary : To secure a rewarding position that provides opportunities to make a rapid and significant impact and contribute to the success of an outstanding company utilizing my strong experience in accounting and organizational positions. Generate collections, including contacting delinquent customers and commencing collection procedures. Process payable invoices for weekly billing cycle and run payable checks including coding and inputting invoices for the 200+ vendors. Coordinated the annual boy scout 4 week fund-raising event with over 3000 scouts in 50+ units to yield total sales in excess of $315,000. Generated and maintained spreadsheet to track unit and individual sales and compile final order. Developed prize request forms for incentives and solicited over $300 per year in donations from local merchants for additional prizes to top selling scouts and units. Organize over 250 parents and scouts per bsa guidelines to ensure proper scouting principles are maintained for all boy scout advancements through eagle. 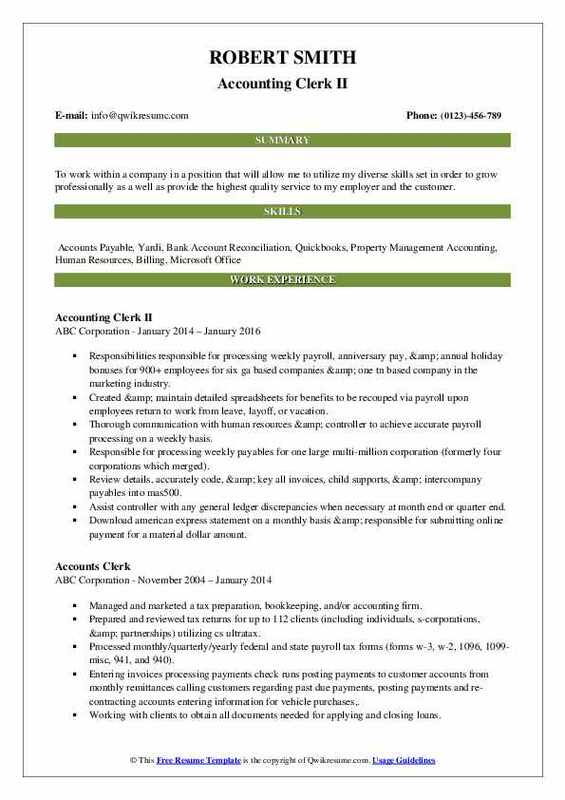 Accounts receivable-prepare daily bank deposits which consist of high amount of cash and checks. Reconciled invoices and corrected cash balance errors using chartwell's accounting system. Objective : Seeking a challenging position that will allow me to grow personally and professionally. I enjoy working with people in a customer service setting, as well as working on my own. I am able to work with minimal supervision. I enjoy goal setting and working hard to achieve my goals. I am reliable, self-motivated, and maintain a strong work ethic. 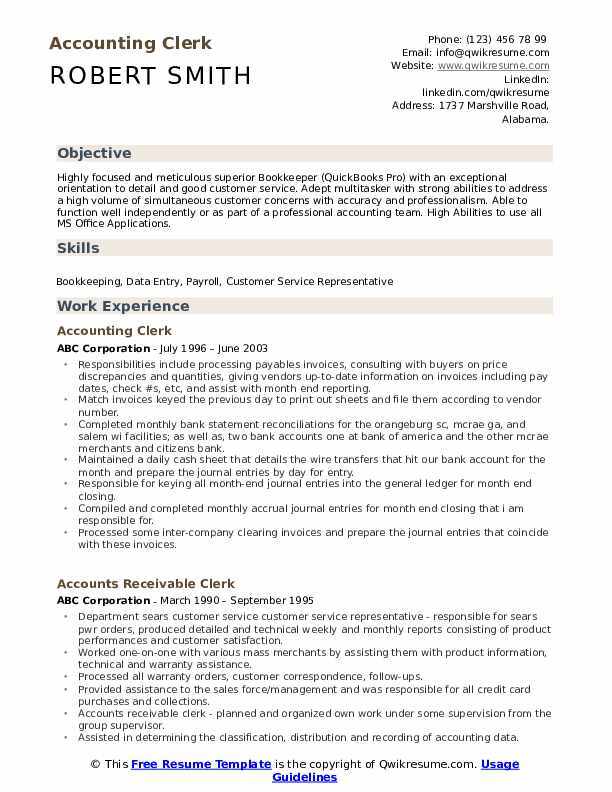 Responsible for assisting the accounting department in the management of mhc financial records, particularly in the areas of accounts payable, accounts receivable, and general ledger reconciliation. 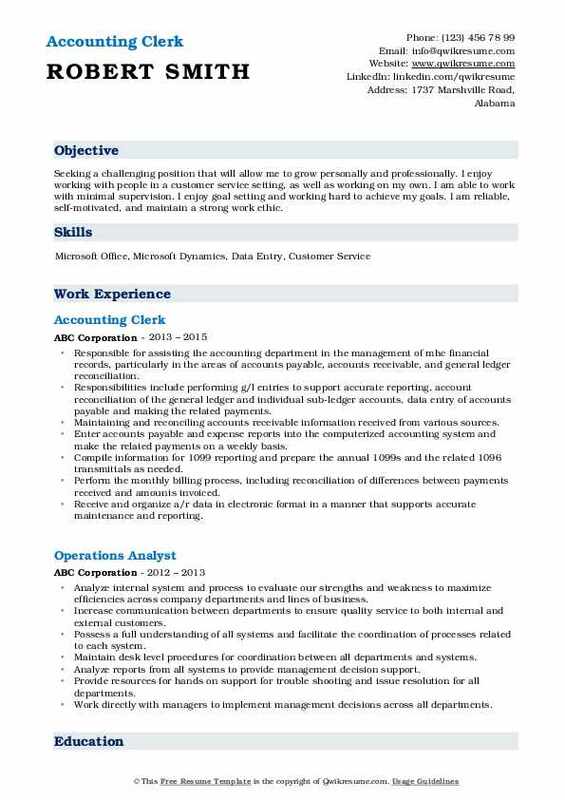 Responsibilities include performing g/l entries to support accurate reporting, account reconciliation of the general ledger and individual sub-ledger accounts, data entry of accounts payable and making the related payments. Maintaining and reconciling accounts receivable information received from various sources. Enter accounts payable and expense reports into the computerized accounting system and make the related payments on a weekly basis. Compile information for 1099 reporting and prepare the annual 1099s and the related 1096 transmittals as needed. Perform the monthly billing process, including reconciliation of differences between payments received and amounts invoiced. Receive and organize a/r data in electronic format in a manner that supports accurate maintenance and reporting. 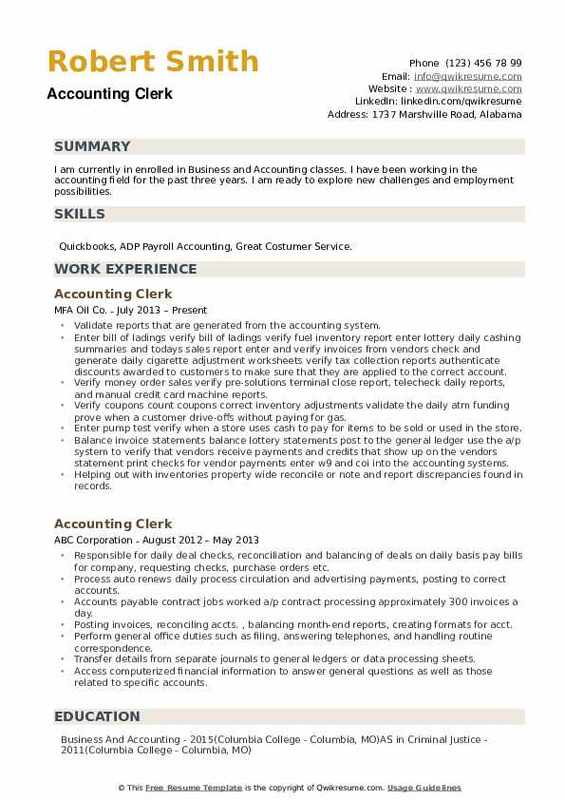 Headline : Detail-oriented Accounting Clerk versed in accounts payable and accounts receivable. Learns quickly and adapts well to new technologies. Strong work ethic, professional demeanor, and great initiative. Supervised invoice processing, purchase orders, expense reports, credit memos and payments transactions. Coded and entered at least 40 invoices each day into the in-house accounting software reconciled vendor statements and handled payment complaints or discrepancies. Prepare cash deposits and create daily and weekly cash reports for accounting management. Handling all telephone inquiries relating to accounts payable and receivable issues. Objective : I am looking forward to utilizing my excellent administrative, customer service, and organizational skills along with my pleasant, personable personality to perform my duties for completion. Compile data from iqware and complete rollover in the M3 accounting system. Enter invoices in the M3 accounting system and into excel spreadsheet checkbook. Attend daily standup meetings and weekly staff meetings presenting all accounting information and update department heads on monthly financial reports. Update each department weekly informing them on their detailed gl reports and monthly explanations to each department head. Provide managers with the 90 day forecast spreadsheet keeping it updated monthly. Accomplished auditing and problem solving for employee deposits of all cash monies collected daily. Figuring commissions for sale representatives as well as finance managers balancing of gl accounts. Accomplished accounting and organization mission by completing related results as needed. 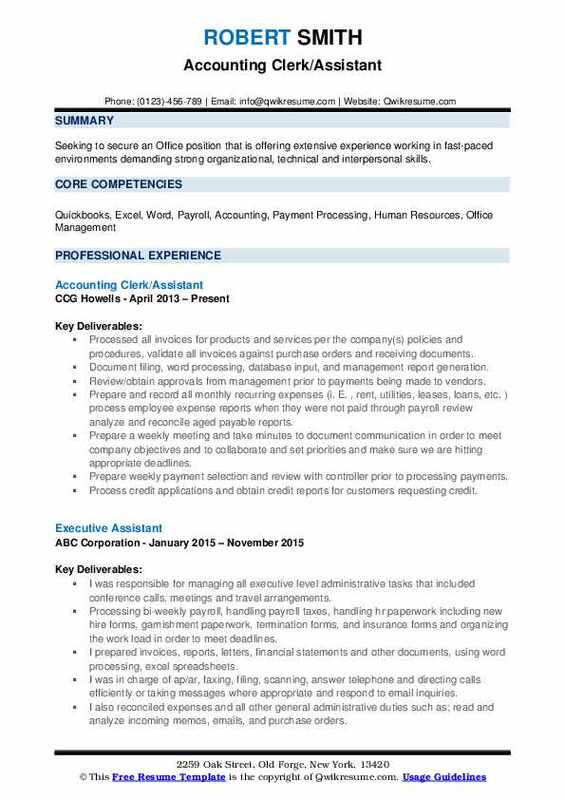 Objective : Seeking a position that can utilize my experience in fast-paced environments that demand strong organizational, technical, and interpersonal skills within an organization that values my commitment to time management practices and my ability to efficiently contribute to organization's goals and objectives. Daily management of accounting tasks, review and oversee a/r, a/p and daily sales information. Accounts receivable collections management reconciliation of all balance sheet accounts posted transactions to the general ledger, reconciliations to accounts, data entry, and processed incentives and rebates for customers. Processed and calculated aftermarket cancellations for finance department. Validated all proper documentation for car sales and verifying accurate calculations before shipment to the financial company. Maintained updated w-9's for vendors per irs and accurately calculated 1099's amounts for rents and vendors for mailing and submission of 1096 for irs. Performed various projects to improve production for the dealership, meeting all deadlines while being a team player. Bank reconciliations- reconcile company bank account on a monthly basis. Maintained information on assigned accounts including payables and receivables. Researched and pursued collections on unpaid invoices and unsubstantiated deductions. Headline : I am currently in enrolled in Business and Accounting classes. 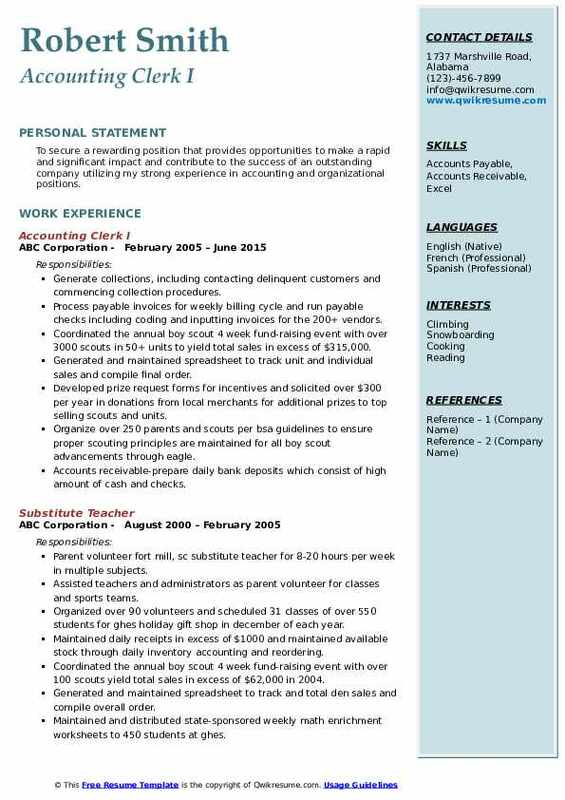 I have been working in the accounting field for the past three years. I am ready to explore new challenges and employment possibilities. 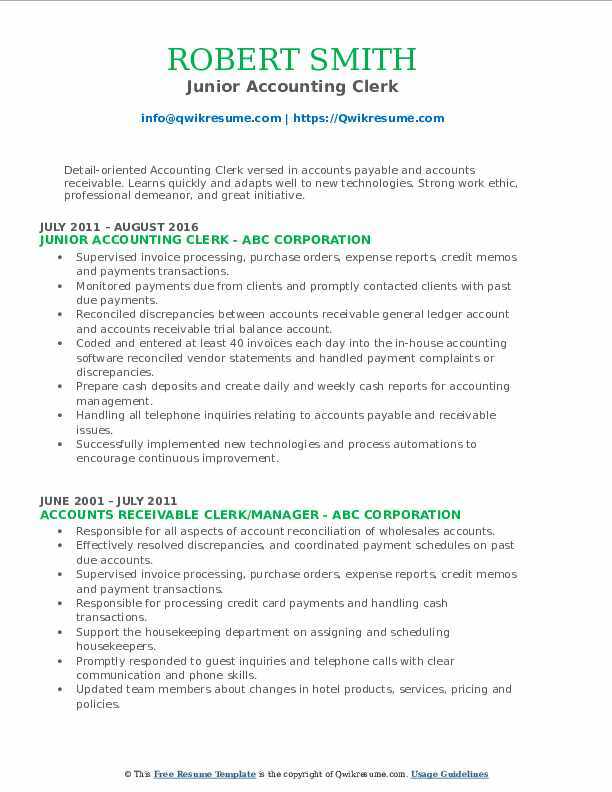 Skills : Quickbooks, ADP Payroll Accounting, Great Costumer Service. Validate reports that are generated from the accounting system. Enter bill of lading's verify bill of lading's verify fuel inventory report enter lottery daily cashing summaries and today's sales report enter and verify invoices from vendors check and generate daily cigarette adjustment worksheets verify tax collection reports authenticate discounts awarded to customer's to make sure that they are applied to the correct account. Verify money order sales verify pre-solutions terminal close report, telecheck daily reports, and manual credit card machine reports. Verify coupons count coupons correct inventory adjustments validate the daily atm funding prove when a customer drive-offs without paying for gas. Enter pump test verify when a store uses cash to pay for items to be sold or used in the store. Balance invoice statements balance lottery statements post to the general ledger use the a/p system to verify that vendors receive payments and credits that show up on the vendor's statement print checks for vendor payments enter w9 and coi into the accounting systems. Helping out with inventories property wide reconcile or note and report discrepancies found in records.